Mitsubishi Electric Corporation (TOKYO: 6503) announced today that Mitsubishi Electric elevators have achieved three GUINNESS WORLD RECORDS® titles for the following record categories: Fastest lift (elevator), Tallest lift (elevator) in a building and Fastest double-deck lift (elevator). All three models are operating in the 632-meter Shanghai Tower, China’s tallest building. 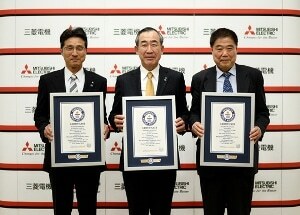 Mitsubishi Electric received the GUINNESS WORLD RECORDS certificates during a ceremony in its head office, Tokyo on December 8. Shanghai Tower is a 632-meter skyscraper complex in the Lujiazui Finance and Trade Zone of Pudong, Shanghai. It houses offices, a hotel, retail stores, conference and exhibition halls, culture and tourism facilities and restaurants. SMEC supplies mid-price products and MESE supplies high-end MAXIEZ series elevators across China. Going forward, Mitsubishi Electric will continue to expand its business in China, the world’s largest market, including through strengthening collaboration with SMEC and MESE.